Fenchurch Street railway station, also known as London Fenchurch Street, is a central London railway terminus in the southeastern corner of the City of London. It takes its name from its proximity to Fenchurch Street, a key thoroughfare in the City. The station and all trains are operated by c2c. Services run on lines built by the London and Blackwall Railway (L&BR) and the London, Tilbury and Southend Railway (LTSR) to destinations in east London and south Essex, including Upminster, Grays, Basildon, Southend and Shoeburyness. The station opened in 1841 to serve the L&BR and was rebuilt in 1854 when the LTSR, a joint venture between the L&BR and the Eastern Counties Railway (ECR), began operating. The ECR also operated trains out of Fenchurch Street to relieve congestion at its other London terminus at Bishopsgate. In 1862 the Great Eastern Railway was created by amalgamating various East Anglian railway companies (including the ECR) and it shared the station with the LTSR until 1912, when the latter was bought by the Midland Railway. The station came under ownership of the London & North Eastern Railway (LNER) following the Railways Act 1921, and was shared by LNER and London Midland & Scottish Railway (LMS) services until nationalisation in 1948. The line from the station was electrified in 1961, and controversially closed for seven weeks in 1994. Fenchurch Street is one of the smallest railway termini in London in terms of platforms, but one of the most intensively operated. It has no direct interchange with the London Underground. Plans to connect it stalled in the early 1980s because of the lack of progress on the Jubilee line, but it is close to Tower Hill on the Underground and to Tower Gateway on the Docklands Light Railway. The station frontage is on Fenchurch Place, adjacent to Fenchurch Street in the City of London. The station has two entrances: one on Fenchurch Place and another on Cooper's Row, near Tower Hill. It has four platforms arranged on two islands elevated on a viaduct. The station has been Grade II listed since 1972 and the conference venue One America Square is built adjacent to it. Following privatisation in 1994, the station was run by Network Rail. Since 1996, the station has been served by c2c (which was sold by National Express to Trenitalia in 2017) who have a franchise to run services until 2029. Fenchurch Street is in the central London Travelcard zone 1 like other terminal stations in the city, but it does not have a direct link to the London Underground. The nearest is Tower Hill about 0.2 miles (0.32 km) to the southeast[a] and Aldgate around 0.3 miles (0.48 km) to the northeast. London Buses route 40 passes the station. The area around Fenchurch Street is one of the oldest inhabited parts of London; the name "Fenchurch" derives from the Latin faenum (hay) and refers to hay markets in the area. The station was the first to be granted permission by the Corporation of London to be constructed inside the City of London, following several refusals against other railway companies. The original building, designed by William Tite opened on 20 July 1841, serving the London and Blackwall Railway (L&BR), replacing a nearby terminus at Minories that had opened in July 1840. It had two platforms connected via a stairway to the booking hall. Steam locomotives did not use the station until 1849 because before this time trains were dragged uphill from Blackwall to Minories, and ran to Fenchurch Street via their own momentum. The reverse journey eastwards required a manual push from railway staff. William Marshall's railway bookstall established at the station in 1841 was the first to be opened in the City of London. The station in the early 1980s; this building was constructed in 1854 by George Berkley. The zig-zag canopy is an addition from the 1870s. Following the opening of the London and Blackwall Extension Railway on 2 April 1849, services operated from Fenchurch Street to Bow & Bromley. Some were extended to Victoria Park & Bow where an interchange existed with the Eastern Counties Railway (ECR) from Bishopsgate. On 26 September 1850, the East and West India Docks and Birmingham Junction Railway (renamed the North London Railway (NLR) on 1 January 1853) started operating a service from Bow into Fenchurch Street and the L&BR withdrew its service, closing the line between Gasworks Junction and Bow & Bromley. The station had two heavily used platforms and a double track line from Stepney onwards. Following a reduced income at Blackwall (the South Eastern Railway had opened a direct line from Gravesend), LBR shareholders voted to align with the ECR and jointly construct the London, Tilbury and Southend Railway (LTSR) from Tilbury to Forest Gate Junction (near Maryland Point). Services would split at Stratford, one service to Bishopsgate and the other to Fenchurch Street along the reopened line via Bow & Bromley (although the station did not reopen). To accommodate this service a third line was built between Stepney and Fenchurch Street which was enlarged at this time. The new service commenced on 13 April 1854 using ECR locomotives and stock. To accommodate the changes, the station was enlarged to designs by George Berkley incorporating a 32 metres (105 ft) by 91 metres (299 ft) trussed-arch vaulted roof. [b] Two platforms were added at the same time as was a circulating area for L&BR and LTSR traffic. The NLR, wanting its own London terminus instead of co-sharing Fenchurch Street, extended its railway towards the new Broad Street station in 1865. The railway through Stratford was unable to cope with the extra services, so the LTSR planned to build a more direct line from Barking to Gas Works Junction. The third track from Stepney to Fenchurch Street opened in 1856, followed by the direct line from Barking in 1858. LTSR services were diverted from Stratford and a spur was opened at Abbey Mills Junction (east of Bromley) which allowed services to and from North Woolwich to operate directly from Fenchurch Street instead of via Stratford. Railway Clearing House diagram of the Fenchurch Street area, 1906. By the 1860s railways in East Anglia were in financial trouble, and most lines were leased to the ECR. Although the companies wished to amalgamate they could not obtain government agreement until 1862, when the Great Eastern Railway (GER) was formed. In common with most railways, signalling was fairly basic and trains were separated by time interval. As traffic levels increased there was a need to improve signalling and in 1869 the GER introduced absolute block working between Fenchurch Street, Gasworks Junction and Bow Junction, opening signal boxes at all locations. In the 1870s the flat awning over the station main's entrance was replaced with the current zig-zag canopy. The station's track layout was rearranged in 1883 with platform extensions, a fifth platform for use by the Blackwall services and a new gantry signal box (which lasted until the 1935 re-modelling). The GER used the station as an alternative to Liverpool Street station during the late-19th and early-20th centuries for former ECR routes. The GER took over operation of the NLR shuttle from Bow in 1869, which it operated until April 1892 when the second Bow Road railway station opened along with a passenger foot connection to the NLR station. Subsequent services into Fenchurch Street were operated by the GER and the LTSR, and three years later the viaduct from Stepney to Fenchurch Street was widened to accommodate a fourth track. Despite this, overcrowding of LTSR services was still occurring and this persisted until 1902 when the opening of the Whitechapel and Bow Railway offered an alternative route. In 1903 the GER built the Fairlop Loop, a short connecting line between Ilford and Woodford from where services ran to Liverpool Street and around 36 trains a day ran to Fenchurch Street. In 1912 the Midland Railway (MR) bought and took over operation of the LTSR services. After the Railways Act 1921 the country's railways were grouped into four companies, with effect from 1 January 1923. At Fenchurch Street the London, Midland and Scottish Railway (LMSR) took over operations of the MR, whilst GER services were taken over by the London and North Eastern Railway (LNER). Direct trains to Gallions were usually routed via Bromley at off-peak hours and a peak shuttle service operated from Custom House to Gallions. Passengers for the North Greenwich branch changed at Millwall Junction. The Blackwall and North Greenwich passenger services were scheduled for closure on 30 June 1926 but the general strike brought that forward to 3 May. The station was rebuilt in 1935 to address overcrowding and provide better accommodation for Southend line services. When the former ECR lines transferred to the Underground's Central line in 1948, the station was served solely by the former LTSR services. Following nationalisation of Britain's railways in 1948, the station transferred under British Railways to the Eastern Region although the old LTSR network west of Gasworks Junction was controlled by the London Midland Region. On 20 February 1949 the whole LTS line was transferred to the Eastern Region, yet despite the organisational changes, the old LTSR still was a distinctive system operated by former LTS and LMS locomotives until electrification. British Railways electrified the former LTSR line in 1959. Electric services began on 6 November 1961 and a full electric timetable was introduced on 18 June the following year. In the 1980s, the station roof was dismantled and high-rise office blocks were built above the station leaving the 1854 facade intact. Fenchurch Street station suffered a negative reputation under public ownership. By the end of the 1980s, the former LTSR line was carrying over 50,000 passengers a day on a 50-year old infrastructure. The persistent overcrowding and uncleanliness on trains led to it being dubbed "the misery line". In 1989 Sir Robert Reid called the service from Fenchurch Street "wholly unacceptable", while Teresa Gorman, Member of Parliament for Billericay, subsequently called it "one of the disgraces of our public railway service for many years". Between 1982 and 1992 the station was operated by Network SouthEast, one of British Rail's three passenger business sectors, before being handed over to a business unit in preparation for privatisation. In July 1994, shortly before privatisation, the station closed for seven weeks for an £83 million project to replace signals, track and electrification works. It was the first significant closure of a London terminal station. The development of Lakeside Shopping Centre, near Chafford Hundred and Thurrock, increased demand for services from the station. In 2013 Network Rail announced a £3.4m upgrade creating a third exit on Cooper's Row to make connections with Tower Hill easier. In the 1970s Fenchurch Street was considered to be an integral part of the proposed Fleet line (now called the Jubilee line), which would have given the station an Underground connection. An extension from the end of the track terminus at Charing Cross to Fenchurch Street via Aldwych and Ludgate Circus would have seen the line cross the River Thames and continue southeastwards towards Surrey Docks and Lewisham. A revised route approved in 1980 would have seen the line follow a more northerly route to Woolwich Arsenal and Beckton. Mott, Hay and Anderson and Sir William Halcrow and Partners began constructing the line to Charing Cross, but did not finish the project until 1979. Rising costs and high inflation led to London Transport abandoning the eastwards extension via Fenchurch Street in 1981. The line was completed in 1999, using a different route via the Greenwich Peninsula to Stratford, crossing the LTSR line from Fenchurch Street at West Ham. This has altered demand for Fenchurch Street, with passengers from Essex changing there instead. During peak periods services are increased up to 20 tph. Most peak services have 12 cars. Although the station's capacity is small compared to other London terminals, it has a high footfall, averaging around 16 million passengers annually. A report in 2001 showed approximately 3,000 people commuted daily from Castle Point to the city via Fenchurch Street, while a 2013 report said it was the busiest station on the LTSR route, with 46,000 daily peak-time passengers. On 1 August 1859, two trains collided head-on at low speed when an arriving North Woolwich service passed a signal at danger and struck a stationary Tilbury Riverside service. No-one was injured. On 28 November 1860, a track defect caused the first four carriages of a departing train to Benfleet to derail at low speed. No-one was injured. On 24 June 1872, a service arriving from Bow collided with the buffer stops at the platform end, resulting in injury to three passengers. On 17 August 1872, two people were injured when their train collided with an empty train being shunted out of a siding. On 2 September 1903, 11 passengers and a crew member were injured when a train hit the buffers as it arrived from Benfleet. On 9 March 1908, a point cleaner working near the station was injured. A Board of Trade enquiry criticised the lack of look-outs for railway workers. On 3 February 1912, approximately 86 people were injured when a train hit the buffer stops as it arrived from Westcliff. An estimated 860 passengers were aboard at the time. Driver error and excessive speed were blamed. On 26 January 1927, 10 people were injured on a train to Westcliff in a head-on collision and subsequent derailment caused by defects in the signal detection and signals. East Smithfield Great Eastern Railway 17 June 1864 1 September 1966 Short quarter-mile branch that led to the Thames riverside. Marked as London Docks on Railway Clearing House diagram above. Goodmans Yard L&BR 1 February 1861 1 April 1951 Built later for ECR and LTSR traffic. Badly damaged during London Blitz. Haydon Square London North Western Railway 12 March 1853 2 July 1962 A short fragment of the viaduct serving the depot can be seen today (2015). The poet John Betjeman passed through the station on day-trips to Southend, and described it as a "delightful hidden old terminus". The first documented murder on the British rail network occurred on 9 July 1864, when Franz Muller murdered Thomas Briggs shortly after a train left the station en route to Chalk Farm. Fenchurch Street is one of four railway stations on the standard UK Monopoly board, alongside Liverpool Street, Marylebone and King's Cross. All are former LNER terminal stations. The 2005 football hooliganism film Green Street used the station to represent Manchester Piccadilly. In the Douglas Adams novel So Long, and Thanks for All the Fish, Fenchurch was so-named because she was conceived at the station. 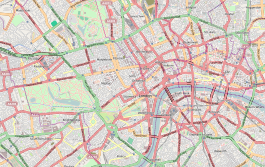 ^ Fenchurch Street is marked as a mainline station next to Tower Hill on a standard Tube Map. ^ Peter Kay suggests that the façade was designed by Tite. ^ Methodological changes reduced this figure by 0.538 million. It would have been 18.583 million without the change in methodology. ^ a b Historic England. "Details from listed building database (1079149)". National Heritage List for England. Retrieved 12 November 2012. ^ "Station facilities for London Fenchurch Street". National Rail Enquiries. Retrieved 29 May 2013. ^ "Fenchurch Street Station". Google Maps. Retrieved 14 July 2016. ^ City 2013, p. 34. ^ "City of London Conference Centres". Cavendish Venues. Retrieved 14 July 2016. ^ "History – Fenchurch Street station". Network Rail. Retrieved 14 July 2016. ^ "Trenitalia Completes c2c Acquisition". Railway Gazette International. 13 February 2017. Retrieved 16 April 2017. ^ "London Fenchurch Street". c2c. Retrieved 14 July 2016. ^ Annual Customer Report (PDF) (Report). p. 2. Retrieved 14 July 2016. ^ "Standard Tube Map" (PDF). Transport for London. Retrieved 3 August 2016. ^ "Fenchurch Street Station to Tower Hill Underground Station". Google Maps. Retrieved 14 July 2016. ^ "Standard Tube Map" (PDF). Transport for London. Retrieved 14 July 2016. ^ "Fenchurch Street Station to Aldgate Station". Google Maps. Retrieved 14 July 2016. ^ "40 bus route". Transport for London. Retrieved 14 July 2014. ^ Weinreb et al. 2008, p. 288. ^ Martin 2012, p. 13. ^ Christopher 2013, p. 27. ^ McCormack 2016, p. 6. ^ a b Christopher 2015, p. 119. ^ a b c Weinreb et al. 2008, p. 289. ^ "Hooked on books". The Daily Telegraph. 20 August 2006. Retrieved 14 July 2016. ^ Connor 1987, p. 38. ^ Freeman 1991, p. 145. ^ Jackson 1978, p. 167. ^ Connor 1987, pp. 38,39. ^ Connor 1987, pp. 43–53. ^ Kay, Peter (October 1994). "Who designed the 1854 Fenchurch Street station?(Letter)". Great Eastern Journal. Vol. 80. Great Eastern Railway Society. p. 26. ^ Christopher 2013, p. 30. ^ McCormack 2016, p. 104. ^ a b c W R Powell, ed. (1966). Economic influences on growth: Local transport. A History of the County of Essex. 5. London. pp. 21–29. Retrieved 14 July 2016. ^ Connor 1987, p. 47. ^ Vaughan 1997, pp. 134,135. ^ a b Kay 1996, p. 71. ^ City 2013, p. 5. ^ Connor 1987, p. 116. ^ Kay 1996, p. 72. ^ Hennessey 2013, p. 128. ^ Brennand 2013, p. 23. ^ Dow 2005, p. 41. ^ Davies & Grant 1983, p. 131. ^ Croome & Jackson 1993, p. 294. ^ Connor & Phillips 1998, p. 8. ^ Hay, John (27 January 1960). "Fenchurch Street-Tilbury-Southend Line (Electrification)". Hansard. Retrieved 15 July 2016. ^ McCarthy & McCarthy 2009, p. 72. ^ a b "Fenchurch Street Line". Hansard. 28 June 1994. Retrieved 15 July 2016. ^ a b "Route F : Thameside" (PDF). Network Rail. p. 6. Retrieved 22 July 2016. ^ a b "£3.4 million upgrade of Fenchurch Street station begins". Network Rail Media Centre. 19 September 2013. Retrieved 22 July 2013. ^ Mitchell 2003, pp. 1,2. ^ Horne 2000, pp. 50–52. ^ Mitchell 2003, p. 3. ^ Mitchell 2003, p. 184. ^ a b "Timetable from 15 May 2016" (PDF). c2c. Retrieved 14 July 2016. ^ London and South East Route Utilisation Strategy (PDF) (Report). Network Rail. July 2011. p. 15. Retrieved 21 July 2016. ^ "Footfall breakdown for each station" (PDF). Network Rail. Retrieved 15 July 2016. ^ "Rail Commuters (Castle Point)". Hansard. 27 February 2001. Retrieved 15 July 2016. ^ "Accident at Fenchurch Street on 1st August 1859". Railways Archive. Retrieved 16 August 2016. ^ "Accident Returns: Extract for the Accident at Fenchurch Street on 28th November 1860". Railways Archive. Retrieved 16 August 2016. ^ "Accident Returns: Extract for the Accident at Fenchurch Street on 24th June 1872". Railways Archive. Retrieved 16 August 2016. ^ "Accident Returns: Extract for the Accident at Fenchurch Street on 17th August 1872". Railways Archive. Retrieved 16 August 2016. ^ "Accident at Fenchurch Street on 2nd September 1903". Railways Archive. Retrieved 16 August 2016. ^ Wardle, George (23 July 1908). "Fenchurch Street Station Accident". Hansard. Retrieved 15 July 2016. ^ "Accident Returns: Extract for Accident at Fenchurch Street on 3rd February 1912". Railways Archive. Retrieved 16 August 2016. ^ "Accident at Fenchurch Street on 26th January 1927". Railways Archive. Retrieved 16 August 2016. ^ Connor 1987, p. 123. ^ Connor, J E (August 1998). Fenchurch Street – Barking. Midhurst UK: Middleton Press. pp. 28–44. ISBN 1 901706 20 6. ^ Hawkins, Chris (1990). Great Eastern in Town and Country. Pinner UK: Irwell Press. pp. 36–42. ISBN 1 871608 16 3. ^ Watling, John; Taylor, Dave; Goldsmit, Paul (April 1996). "Lineside features 2:coal drops". Great Eastern Journal. 86: 16. ^ Christopher 2013, p. 26. ^ Arthur & Mary Sellwood (2013). Death Ride From Fenchurch Street & Other Victorian Railway Murders. Amberley Publishing Limited. pp. 9–10. ISBN 978-1-445-62337-5. ^ Moore, Tim (2003). Do Not Pass Go. Random House. pp. 158–159. ISBN 978-1-409-02216-9. ^ "Green Street film locations". The Worldwide Guide To Movie Locations. Retrieved 15 July 2016. ^ Adams, Douglas (2009) . So Long, and Thanks for All the Fish. p. 66. ISBN 978-0-330-51317-3. Brennand, Dave (2013). London's East End Railways Part 2. Nottingham UK: Booklaw Publications. ISBN 978-1-909-62501-3. Christopher, John (2013). The London & Blackwall Railway. Amberley Publishing. ISBN 978-1-445-65111-8. Connor, J E (1987). Stepney's own railway (2nd ed.). Colchester UK: Connor and Butler. ISBN 0-947699-08-2. Connor, J E; Phillips, Charles (August 1998). Fenchurch Street to Barking. Midhurst UK: Middleton Press. ISBN 1 901706 20 6. Croome, D; Jackson, A (1993). Rails Through The Clay – A History of London's Tube Railways. Capital Transport. ISBN 1-85414-151-1. Davies, Reginald; Grant, M.D. (1983). London and Its Railways. David & Charles. ISBN 978-0-715-38107-6. Dow, Andrew (2005). Telling the Passenger where to Get Off: George Dow and the Evolution of the Railway Diagrammatic Map. Capital Transport Publishing. ISBN 978-1-854-14291-7. Freeman, Michael (1991). Transport in Victorian Britain. Manchester University Press. ISBN 978-0-71-902333-0. Hennessey, Thomas (2013). St Pancras Station Through Time. Amberley Publishing Limited. ISBN 978-1-44-562408-2. Jackson, Alan Arthur (1978). London's Local Railways. David and Charles. ISBN 978-0-715-37479-5. Kay, Peter (1996). The London, Tilbury and Southend Railway:A history of the company and line Volume 1 1836-1893. Peter Kay. ISBN 1 899890 10 6. McCormack, Kevin (2016). London Local Trains in the 1950s and 1960s. Casemate Publishers. ISBN 978-1-473-86799-4. Mitchell, Bob (2003). Jubilee Line Extension: From Concept to Completion. Thomas Telford. ISBN 978-0-727-73028-2. Vaughan, Adrian (1997). Railwaymen, Politics and Money. London: John Murray. pp. 134, 135. ISBN 0 7195 5150 1. Area Enhance Strategy Part 2, Fenchurch and Monument Area Strategy (Report). City of London Corporation. 2013. Wikimedia Commons has media related to Fenchurch Street railway station.